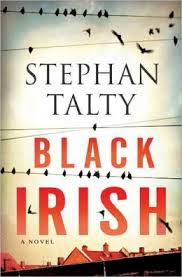 Black Irish written by Stephan Talty is a March 2013 release, published by Ballantine Books/Random House. Absalom ( Abbie) Kearney is a cop working for the small enclave dubbed "The County" in Buffalo, New York. Abbie grew up here, but always felt like an outsider. She had been adopted by a highly respected cop in this predomintately Irish community. Abbie's dark hair and translucent skin made her stand out. She worked in Miami for awhile, but has come home to care for her father who has Alzheimer's. The mutilated body found in a church has Abbie and her partner "Z" on the case. But, not only is the murder itself shocking, but the reaction of the victims wife and mother are equally strange. As Abbie works the case, she discovers the victim was a member of a secret society. Then another murder takes place, more grizzly than the first. The more Abbie digs the more she is stonewalled by her fellow cops, "The County" and anyone else that may have a clue about who is behind these murders. A lonely librarian is Abbie's best source of information as she learns how involved the IRA has been over the years in this very part of Buffalo. Is the secret society and IRA involved in these murders or is it the work of a serial killer with huge vendetta? Abbie's investigation leads her to the darkest place of her past as she suspects her father may be the next person on the killer's list. On top of that, the killer has left little toy monkeys at his crime scenes like a signature. This is taut suspense thriller. In fact, it's the best thriller I've read in a while. It's hard to believe this is the author's first novel. Incredible. In the beginning the novel is like a police procedural. A body is found and the normal investigation steps are taken. But, then the novel takes a turn when Abbie finds out about the Clan. The history of this secret society, the IRA and it's role changes after 1998, the closed off community that keeps Abbie on the outside looking in as much as possible, Abbie's fear for her father, and the personal communication the killer seems to have with Abbie all build the suspense. There are scenes that had me riveted. I could actually feel the inhuman cold and sleet and could taste the fear of the victims and and the cops working the case. This is one mean serial killer. The killings are graphic and brutal. This book is not for the faint of heart. This is a very gritty crime thriller, with lots of twist and turns. You will not feel relief until the last few pages. No one is to be trusted and Abbie, ever the outsider, must face down the killer alone as she learns shocking secrets about her own past. Highly recommend! A+ Thanks to the publisher and to Netgalley for the ARC.